Ibn Ouf, regime insider turned new Sudan ruler - SABC News - Breaking news, special reports, world, business, sport coverage of all South African current events. Africa's news leader. 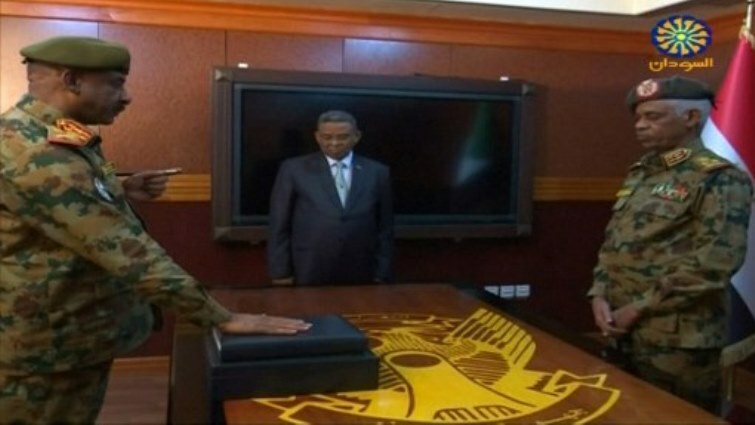 A grab from a broadcast on Sudan TV shows Defence Minister Awad Ibnouf (R) looking on as army's chief of staff Lieutenant General Kamal Abdelmarouf takes oath on April 11, 2019. Sudanese General Awad Ibn Ouf, who led the overthrow of veteran leader Omar al-Bashir and has emerged as the country’s new ruler, is already under US sanctions for his alleged role in the brutal Darfur conflict. In a sombre televised statement on Thursday, Ibn Ouf announced the ouster of Bashir, who ruled the northeast African country with an iron-fist for 30 years before angry protesters brought him down. “I announce as minister of defence the toppling of the regime and detaining its chief in a secure place,” Ibn Ouf said. Later on Thursday state television announced that Ibn Ouf had been sworn in as head of the military council triggering anger among the protesters. Born in 1950, Ibn Ouf, a career soldier has been a regime insider and a close aide of Bashir since the former leader came to power in a coup in 1989. Ibn Ouf held several top ranking positions in the army as well as in the foreign ministry. “Awad Ibn Ouf is not only a high-ranking officer of Bashir’s old guard, but one of the few in the army to be able to maintain the cohesion between the rival branches of the regime’s security apparatus,” said Paris-based Sudan analyst, Jerome Tubiana. Between 2010 and 2015, Ibn Ouf served as a counsel in Khartoum’s embassy in Cairo and later as ambassador to Muscat. Analysts say Ibn Ouf, a close aide of Bashir, played a key role in managing the Arab militias like the feared Janjaweed, who have been accused of committing genocide during the initial years of the conflict. In May 2007, Washington said Ibn Ouf has been “linked to violence, atrocities and human rights abuses” in Darfur. Ibn Ouf was as “deeply involved” in the conflict as Bashir himself, said Hollywood actor George Clooney on Thursday. But analyst Tubiana said the fact that Bashir agreed to go and Ibn Ouf had replaced him showed that it was “a palace revolution, aimed at protecting the regime and preventing the opposition, civilians and non-Islamists … from taking power”. Some analysts say however that Ibn Ouf might not remain for long time as head of the military council. This entry was posted on 12 Apr 2019,04:30PM at 4:30 PM and is filed under Africa. You can follow any responses to this entry through the RSS 2.0 feed. Both comments and pings are currently closed.